AMBER LOVE 27-OCT-2017 The FARRAH WETHERS MYSTERIES and MISTY MURDER are available through sites like Amazon and Barnes & Noble. 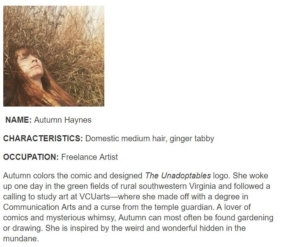 Please go to patreon.com/amberunmasked to sponsor the show, the site, and my work. THE UNADOPTABLES is an adorable webcomic about a cat cafe written by today’s guests Margaret Chiavetta and Brooks Peck and issue one is illustrated beautifully by Beth Morrell with Autumn Haynes as the color artist. As you can imagine we spent most of the time talking about our cats, how those cats have influenced our writing, and how challenging the adoption process is. 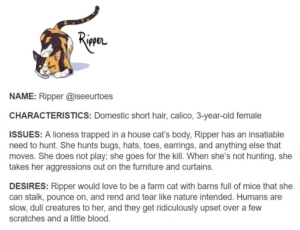 Each of the cats in THE UNADOPTABLES has a quirk and unique personality plus you have some interesting humans. 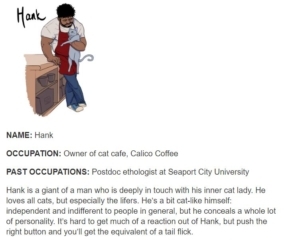 Hank is the main human character who runs the cat cafe and lives in the apartment above it. 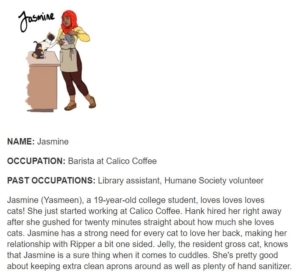 Jasmine is a volunteer who works at the cat cafe, but she is terribly allergic. We talk about the love for bodega cats in cities and the Turkish documentary about cats who are beloved in Istanbul (https://www.kedifilm.com/). Brooks is a museum curator who has an affinity for museum cats who keep the rodent population down. As far as producing a webcomic, Brooks said they are doing what they can to follow the first rule: have your pages come out consistently (a page a week). 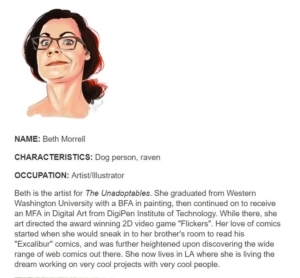 After coming up with the idea and having material ready, they searched for an artist and found Beth Morrell on LinkedIn. They said that began reaching out to their own community about six months before the Kickstarter launched. Margaret managed the project using three tiers of email contacts: close personal friends who will pledge, people you don’t talk to on a regular basis, and then people you don’t know well but feel comfortable reaching out to. Margaret also personalized almost all the emails. In order to keep up the pace of releasing the comic issues, they have hired a second artist for issue two and then Beth will pick up with issue three. They’ll also be taking their creative works to Patreon and offering rewards like more cat videos and behind-the-scenes posts. The comic will stay free on sites like tumblr and tapas. 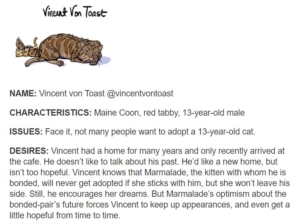 Issue one focuses on Marmalade and Vincent; issue two will be Ripper and Hank with a Jelly secondary B story. Margaret and Brooks have also successfully funded Margaret’s first novel on Kickstarter (a YA fantasy) so we discussed the differences and similarities in that funding process. The Alchemist’s Theorem: Sir Duffy’s Promise features an autistic protagonist. It was much easier to find an audience for the cats than for a middle grade/YA novel. However, due to the funds from Kickstarter, Margaret was able to reach out for reviews at high profile places like Kirkus. One of the best things they did to garner interest was hire an artist to add visuals to their pitch. The shipping of the final printed was done by the printing company, Thomson-Shore. Gus & Oliver thanked by The Unadoptables!